Tired of waiting at least an hour for beautiful baked potatoes? Pressure cooker to the rescue! 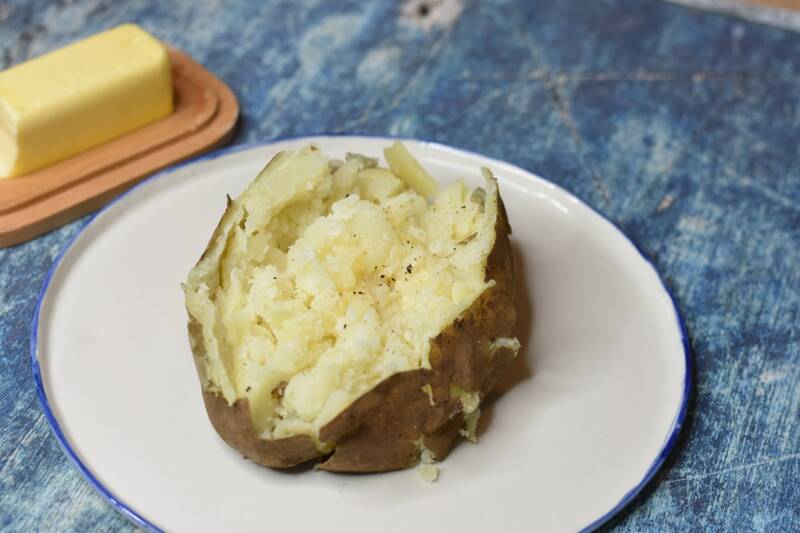 Get perfectly "baked" potatoes in 30 minutes every time using your electric pressure cooker. 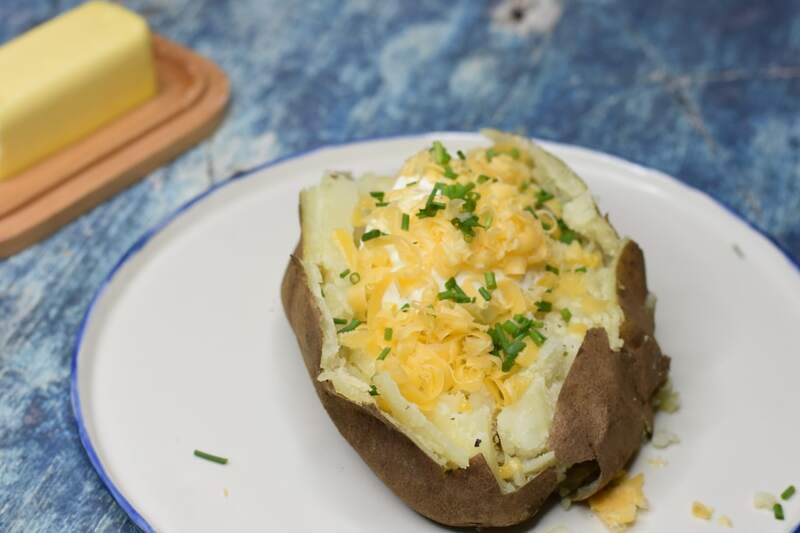 Baked potatoes are a kitchen staple in my house. I love them with plenty of toppings, or sometimes go simple with just butter, salt, and pepper. The only problem I have is waiting for the potatoes to bake. Depending on the potato (Costco-size Russets), baking can take up to 90 minutes! Thank goodness for my pressure cooker! Now I can get fluffy, delicious potatoes in under an hour and it's so easy! Follow this step-by-step guide to get mouth-watering, fluffy potatoes every time. Click here to cut to the chase and view the recipe. 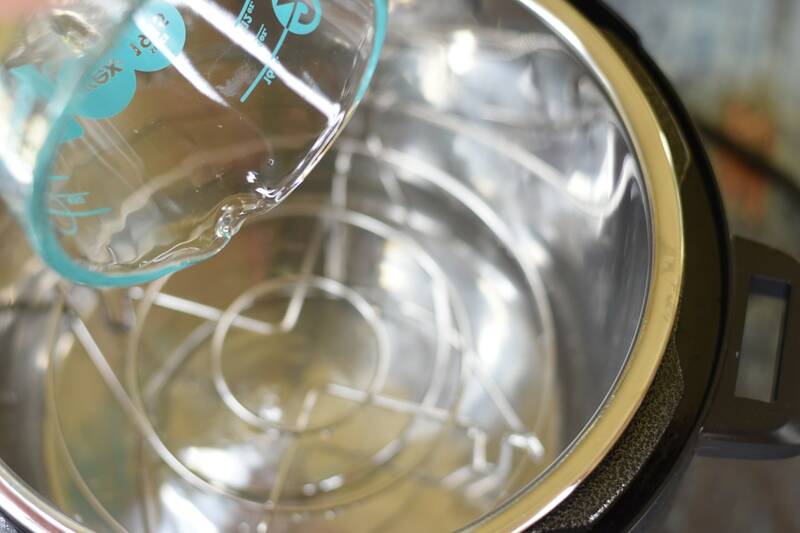 Place trivet in the base of the stainless steel inner pot and pour 1½ cups water into pot. Scrub potatoes and prick all over with a fork (this is crucial; you don't want your potatoes to burst or crack)! Place scrubbed potatoes on top of trivet. 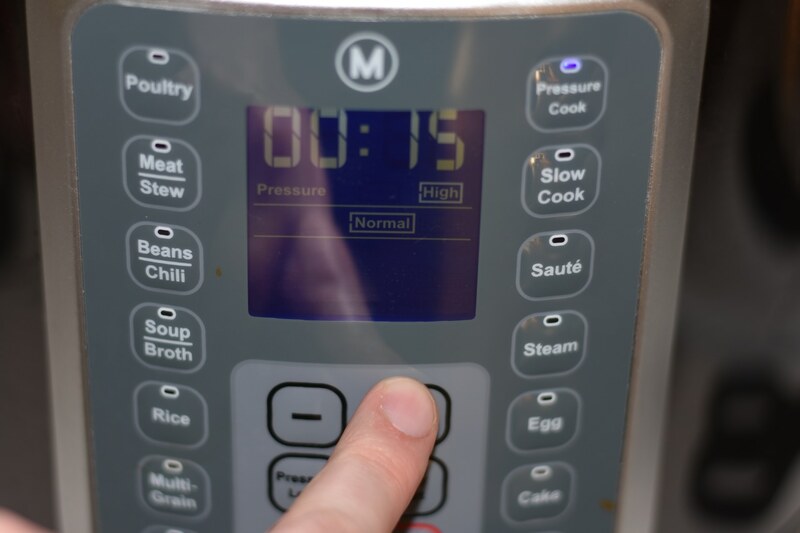 Lock pressure cooker lid in place, set steam vent handle to Sealing, select Pressure Cook, and cook on High pressure for 15 minutes. If you've got smaller potatoes, set to 10 minutes. Let pressure release naturally for 15 minutes before turning steam vent handle to Venting to quick-release remaining pressure. 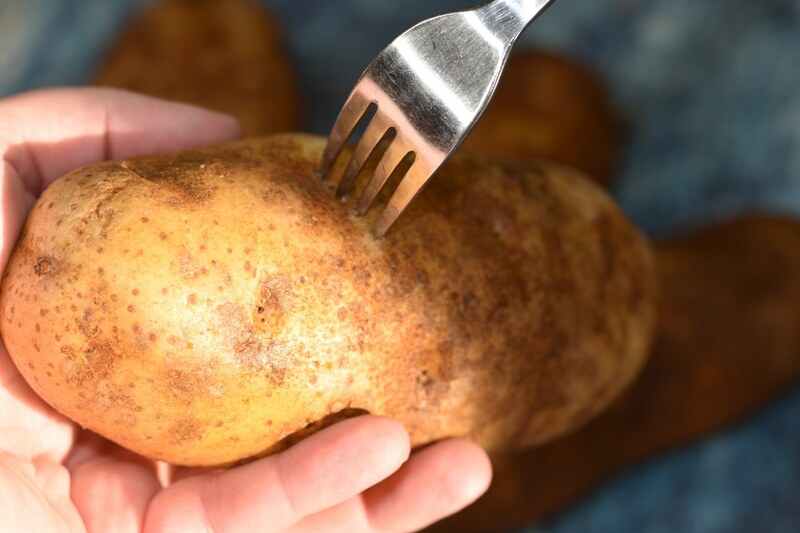 Remove potatoes from pot, slice down the middle, and fluff insides with a fork! Top potatoes with all the fixin's you desire. I topped this with butter, salt, pepper, sour cream, chives, and cheddar cheese. After I took this picture I might have found some leftover chili in my fridge and poured that all over the top! Happy cooking! 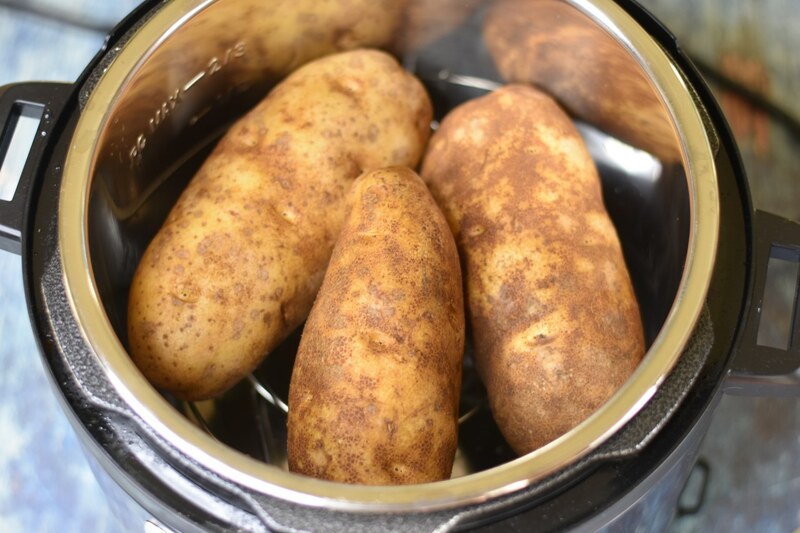 If you like a crispy skin on your baked potatoes, rub your cooked potatoes all over with a little olive oil right when then are done cooking in the pressure cooker. Line a sheet pan with aluminum foil, place cooked potatoes on prepared sheet pan, and cook at 400 degrees Fahrenheit until potato skin is crispy, about 5 to 10 minutes.